These Beans Need Your Help! Dr Robotnik, that malicious master mind of planet Mobius, is always coming up with new ways to menace the world and its inhabitants. Witness his latest plan - the Mean Bean-Steaming Machine, which changes the jolly folk of Beanville into robot slaves that will help the deranged doctor rid Mobius of music and fun forever! Robotnik's henchbots are rounding up all the unfortunate bean folk they can find and grouping them together in dark dungeons. 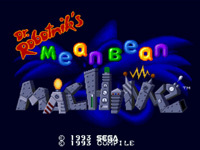 Once four or more beans are put in a group, they are teleported to the Mean Bean Machine and a horrible fate! Here's where you come in. You can group the bean folk and allow them to escape! However, there is only a short amount of time before the dungeon overfills and bursts open. To make things worse, the henchbots have noticed you, and are trying to find ways to short-circuit your plans for good! It's a dungeon-to-dungeon battle between you and Robotnik's henchbot jailers! You must move quickly and set up strategies to bust each enemy's dungeon wide open. It you succeed, you'll be send up the line to deal with the wilier henchbots, and eventually with that rotten Robotnik himself! The beans are counting on you! * A French case has been seen and was probably used on reissues (Given the 'new style' design), even though the European release already had French support (as normal). This has a small change to the title (Dr. Robotnik and his mean bean Machine) and the back text explains about it's game play and features, gives two small reviews, and says about it is on MegaDrive, Master System AND Game Gear. There is also a completely new image used on the front of the case. * This Korean release was released as with most Megadrive games, by the Korean company Samsung. Pretty much follows the standard boxart but without normal framing.